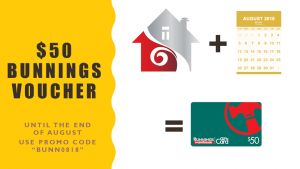 How does a $50 Bunnings voucher sound? If you know anyone looking to build, make sure they speak to me BEFORE signing their building contract to extract best value from their design and contract. For the month of August customers completing their registration using the promo code “BUNN0818” and making payment by the 31st will score a $50 Bunnings voucher for a referrer.